For the 6th consecutive year, the institution that is loved by many people is here and will be held the three – day June 17-18-19 at Matala municipality of Faistos in Crete. 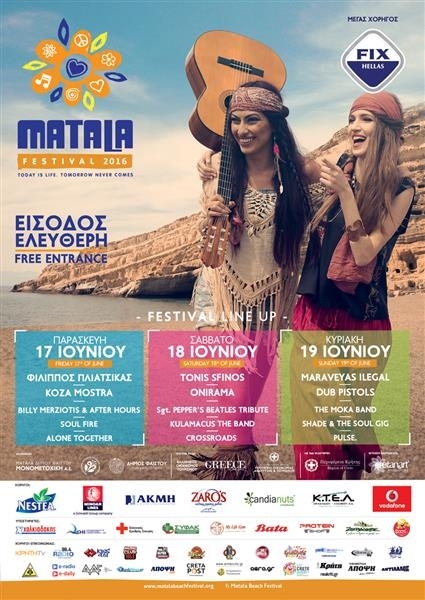 Music will give once again the signal for the largest Greek festival to start, with free entry for everyone and it’s certain that it will offer memorable moments to all guests at Matala Beach, in early summer 2016. Artists and bands like Dub Pistols, Kostis Maravegias, Toni Sfinos, Onirama, Koza Mostra, Filippos Pliatsikas and many others, will step out on stage of Matala Festival. There will be many other activities for all guests, children and adults will be able to take an active part and have fun from morning to late evening. The countdown for the biggest event of the summer has already begun!!! Today is life, tomorrow never comes!! !